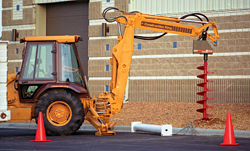 Operators can use the Dig-R-Tach® line with hydraulic systems of any size. It is ideal for skid-steer loaders, small excavators, knuckle-boom cranes, and small backhoes. The Series 16 features a two-speed chain and sprocket drive and a 5- to 20-gallon-per-minute (gpm) hydraulic flow range. The Series 16 balances smaller flow volumes in proportion to auger diameters, resulting in a cleaner hole with less loose soil and debris. For higher-capacity drilling, the Series 24 operates in a 15-25-gpm hydraulic flow range and delivers a maximum drilling torque of 2,018 foot-pounds at 2,500 pounds per square inch.